In the early days of TV broadcasting it wasn’t uncommon to see the phrase, “Please Stand By” on your television screen. It was a way of holding your attention until the next image, event, or broadcast appeared on your screen. 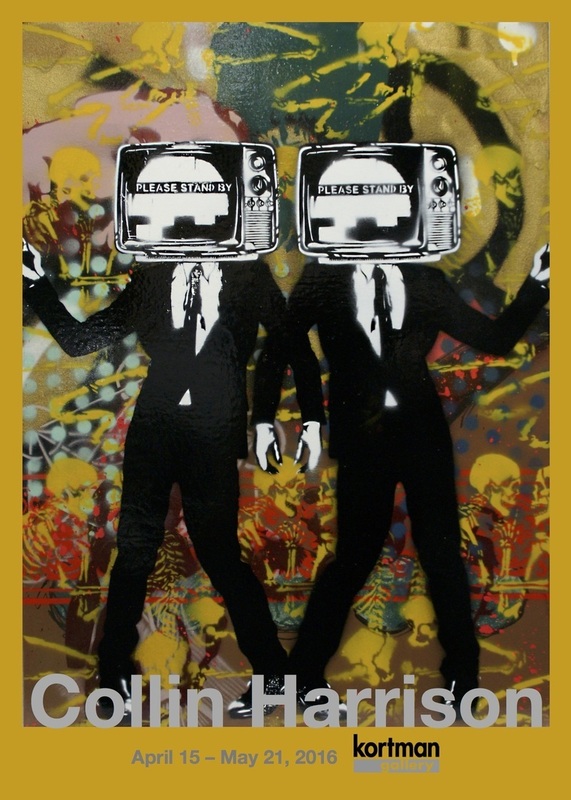 Rockford artist Collin Harrison has titled his Kortman Gallery exhibit, “Please Stand By” to emphasize his fascination with the layers of visual history that surrounds us not only though electronic media, but also in graffiti, where artists push themselves to the forefront of the conversation by painting over already existing work. black & white focal stenciled image that pushes itself out of that noise,” said Harrison. “I use natural, spiritual, and pop culture iconography to explore the things people go to outside of themselves for information and guidance, namely, religion and the modern media,” writes Harrison in his artist’s statement. “Collin’s art does emulate the visual language of graffiti artists, but utilizes a refined technique of layering images with stenciling and spray paint to create colorfully complicated, sophisticated paintings that are a feast for the eyes,” says Kortman Gallery director Doc Slafkosky. and received his Associate of Arts from Rock Valley College. Harrison is now a senior BFA student at Rockford University. Previously, his work has been on display in collective Art Scene exhibitions, in his college literary magazines, as well as in the emerging artist booth at Rockford Art Museum’s Greenwich Village Art Fair. The Kortman Gallery exhibit “Please Stand By” by Collin Harrison will open in conjunction with Spring ArtScene, Friday, April 15th, 5 to 10pm and Saturday, April 16th, 10am to 9pm. It will be on display through May 21st. Kortman Gallery is located upstairs at J. R. Kortman Center for Design, 107 North Main Street in Downtown Rockford. For more information call 815-968-0123. There's still something special about seeing great images in print! The "coffee table" book is a great way to appreciate beautiful photography, architecture, and art with something that is a part of your home experience that's tactile, permanent, and stimulating. 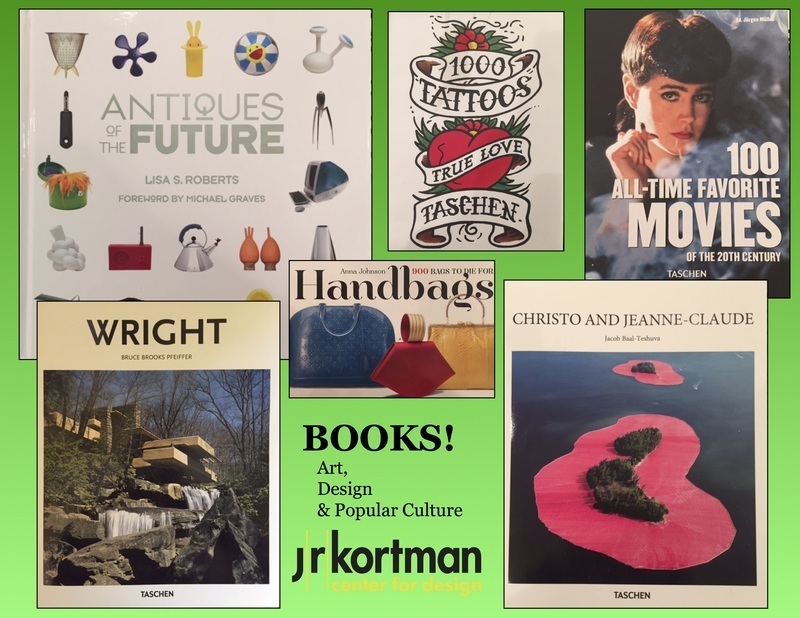 J. R. Kortman has an intriguing selection of books from Taschen, Workman, Abrams, Pomegranate Press, and other fine publishers of collectible books. The Más Tequila Review and J.R. Kortman Center for Design are collaborating to bring poetry back to downtown Rockford. 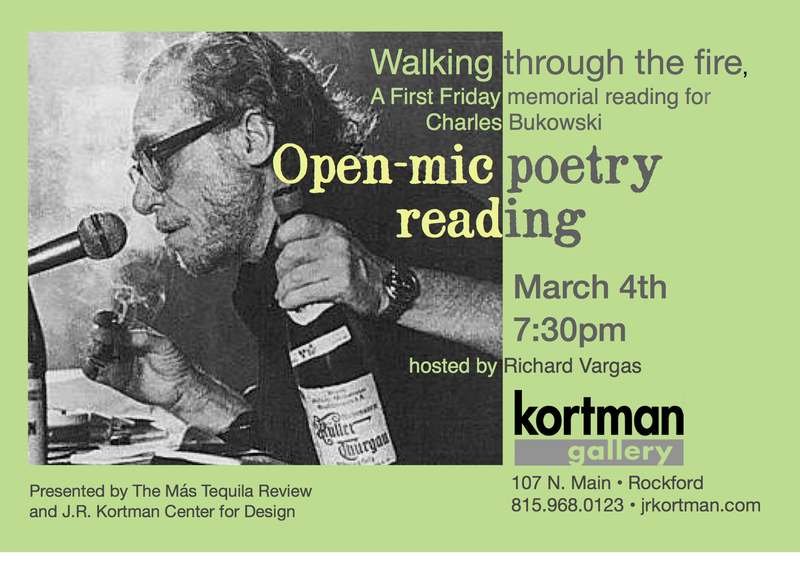 An open mic celebrating the poetry of one of the country's most prolific poets, Charles Bukowski, who died March 9, 1994, will be emceed by poet and editor, Richard Vargas. Participants are asked to read their favorite Bukowski poem, and an original poem of their own. Sign up for the open mic will begin at 7:30 PM, and is limited to the first 15 readers. (Additional readers will be considered if time permits.) Reading will commence at 8:00 PM. Admission is free and open to the public. Various poetry stuff will be raffled during the event, provided by The Más Tequila Review . 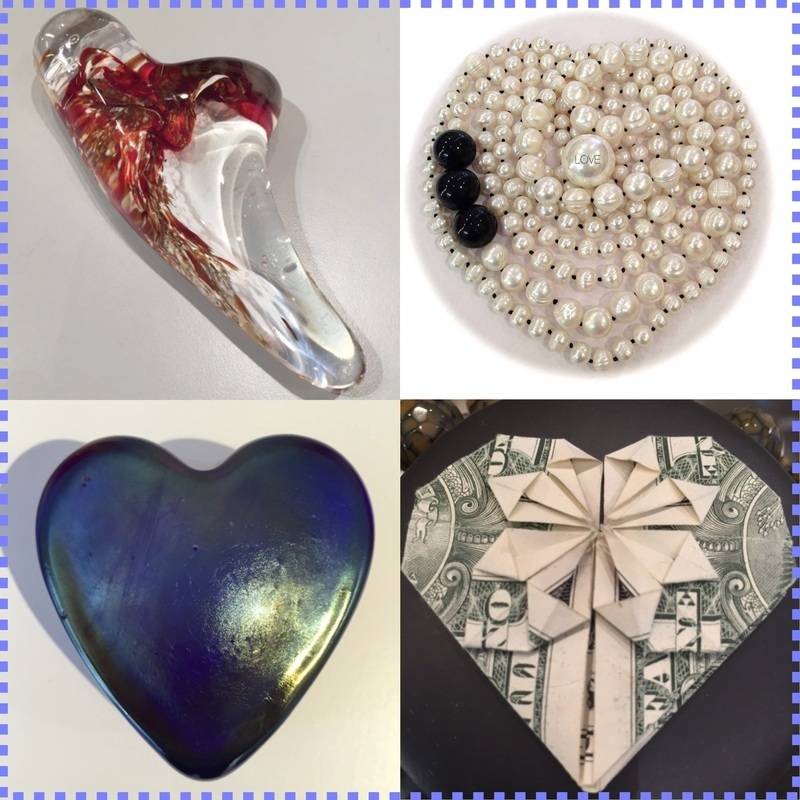 A Valentine's gift from J. R. Kortman Center for Design will be treasured for a lifetime! The dictionary defines “toyed” as a verb meaning to amuse oneself as if with a toy. That sense of playful energy that motivates Rockford artists R. Scott Long and Betsy Youngquist can be experienced in “Toyed,” an exhibition of new works opening Friday, February 5th in the Kortman Gallery. 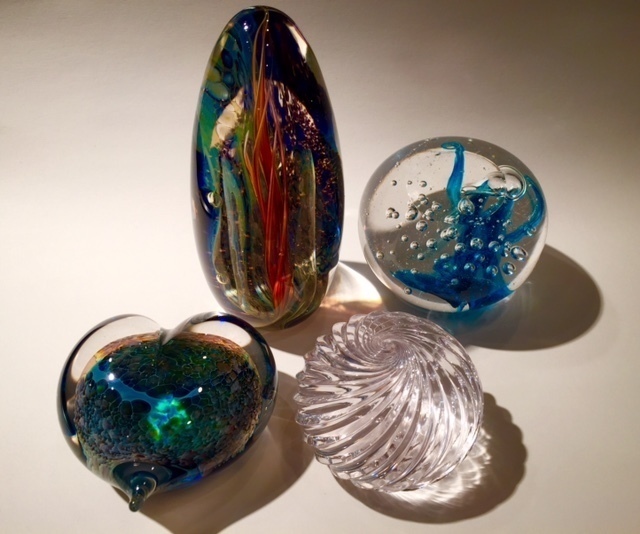 The exhibition will showcase three-dimensional pieces by both artists, many of them collaborative, that were, according to the artists, as fun to make as they are to see. 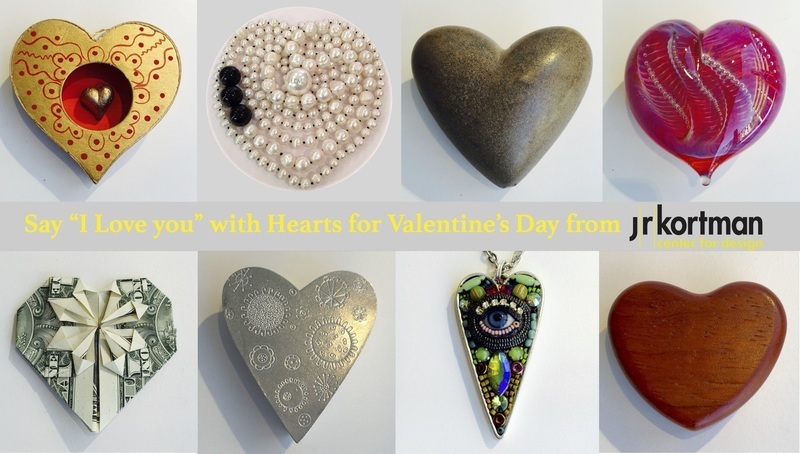 Youngquist has earned an international reputation for her beaded works of art that are often created on sculptural elements fabricated by sculptor/collaborator R. Scott Long. In this exhibit, Long will also be showing his own art works. Doc Slafkosky, Kortman Gallery director, says the “Toyed” exhibit should appeal to a broad audience. “Whether you’re a serious collector or just enjoy seeing art, this colorful, playful, beautifully executed exhibit will be a visually entertaining, exciting, and even magical experience,” says Slafkosky. 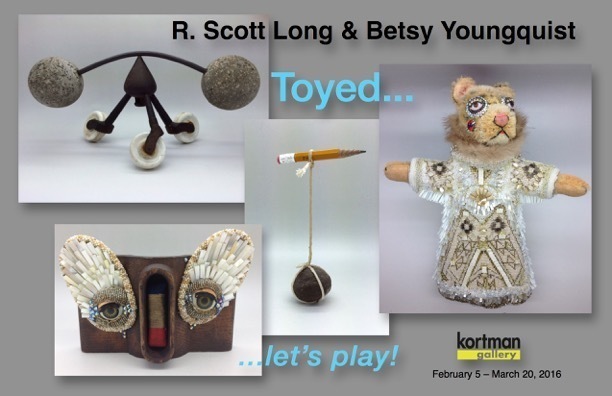 The Kortman Gallery exhibit “Toyed” by R. Scott Long & Betsy Youngquist will open First Friday, February 5th, 5:30 to 9pm and will be on display through March 20th. Kortman Gallery is located upstairs at J. R. Kortman Center for Design, 107 North Main Street in Downtown Rockford. 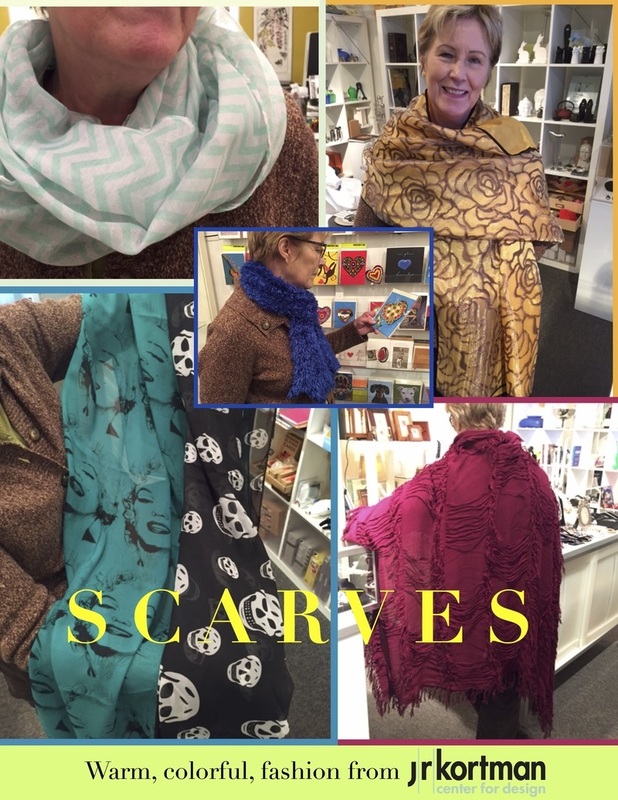 Warm, colorful, fashion: Scarves from J. R. Kortman Center for Design! 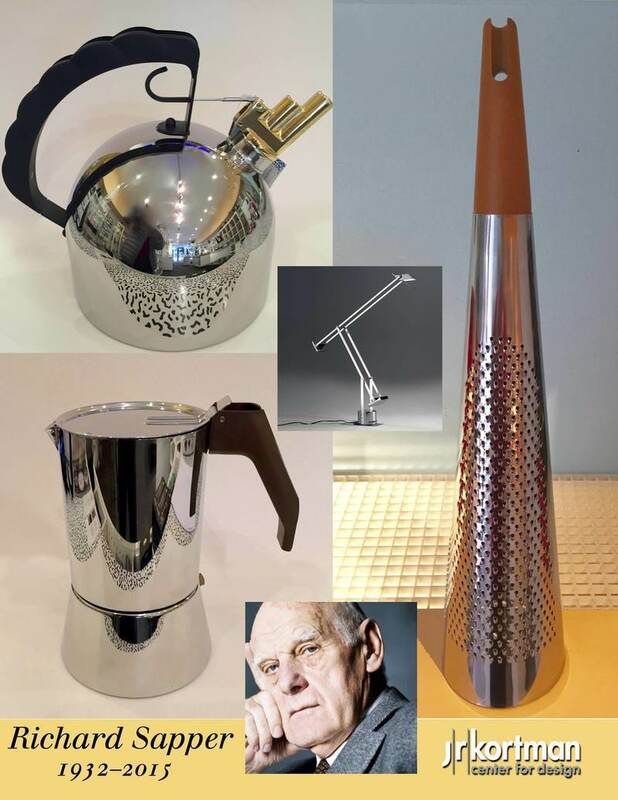 From the Tizio lamp to Alessi's Bollitore Water Kettle, industrial designer Richard Sapper has brightened our lives with his sturdy, functional, and beautiful products that have sustained their relevance, value, and elegance. Mr. Sapper died on December 31st, 2015. J. R. Kortman has been selling Sapper designed products since we first opened in 1986. The now classic water kettle Bollitore, in 1986, was priced at $95, and is still available at J. R. Kortman. Today it retails for $330. The kettle, and many other Sapper designs, are in permanent museum collections around the world, including the Museum of Modern Art in New York.